With splashy promotional pieces touting its 2014 summer reading campaign, the Brooklyn Public Library is enticing thousands of local school children, many of whose academic year ends this week, to patronize its 60 branches located throughout the vast borough. The kids just shouldn’t be surprised if the air conditioning at their local branch is on the fritz. With the onset of summer, public libraries have traditionally offered all ages a refreshing respite from the heat. However—as a result of massive capital deficits now totaling $308 million dollars—in the past few years BPL has struggled with HVAC problems during the dog days of summer. According to a document on its website titled Brooklyn Public Library’s Overall Estimated Capital Construction Needs, 28—count ‘em, 28—BPL branches are estimated to require HVAC repairs of $750,000 or more. At the suggestion of a sharp-eyed Brooklyn Heights Blog reader, BHB conducted a quick telephone survey of these HVAC-challenged branches. The librarian at the Walt Whitman branch in Fort Greene, one of 18 BPL branches built in the early 20th century with funds donated by philanthropist Andrew Carnegie, admitted that air conditioning issues have cropped up “from time to time,” but that all was currently well at present. At BPL’s Central Library at Grand Army Plaza – which has an estimate of $9,500,000 for HVAC issues as part of a whopping $67,750,000 renovation estimate—the A/C was fine, though the librarian who answered the phone expressed surprise about any inquiry regarding the building’s summer fitness. Many librarians who responded to BHB’s informal survey assumed any call about air conditioning problems reflected concern about the Brooklyn Heights branch, where hours of operation have been cut to 8am – 1pm due to $3,600,000 in desperately needed HVAC repairs, just part of overall costs of $9,225,000 in upgrades required for the popular branch to be fully operational year round. Of course, BPL’s plan for this particular library is to forgo repairs and simply replace the entire building as part of a sell-off of the branch to a developer who will build a brand new 20,000 square feet library in a 40-plus story residential tower. Presumably, whatever temporary location that will serve the community during construction will have state-of-the-art HVAC systems. An announcement of whom BPL will select to develop the site may be announced in the next few weeks—just in time for August swelter. 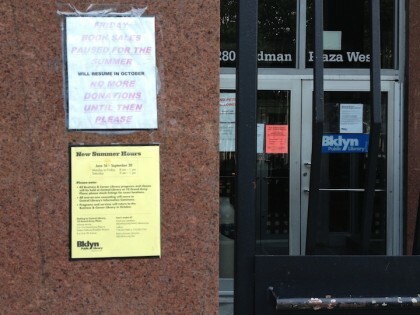 Photo: Brooklyn Heights Branch Library with summer hours posted. I think libraries are quickly losing their utility. Which is ultimately a good thing because the amount of online content is growing exponentially and running libraries is expensive for taxpayers. I would support the Bklyn Bugle’s fundraising effort, but when I check in the only option is $100. Incorrect. The level to claim a “perk” is $100 – folks can donate any amount. As a writer, voracious reader and student, I am grateful that we can access so many books online. But, after spending 12+ hour per day staring at technology, there is nothing I look forward to more than turning the pages of a good book while holding it in my hands at the end of the day. Uhm….they have a solution to Brooklyn Heights. A plan to build a new library and fix all their other libraries. Sadly NIMBYs like you and your friends in the Heights who don’t want to see any real estate develop or new affordable housing anywhere are working to stop it without coming up with any actual alternatives. CONDITIONING CRISIS THAT CLOSES OUR BRANCH DURING HEAT SPELLS FOR THIS THE THIRD CONSECUTIVE YEAR. ALSO the public is not allowed to speak at these meetings even though they get the majority of their funds from public monies. and for this she makes more than the Mayor?? Hey, you could have credited me—after all, Homer turned my name into a verb recently. It is important to note that, going all the way back to Donnell, there has never been a library that the BPL or the NYPL wanted to sell where they didn’t say that there was an air conditioning problem was motivating them (except for the recently completed Science, Industry and Business Library at 34th Street). The question is whether this works in reverse? : Is evey library with an air conditioning problem going to be up for sale? For the BPL its hard to sell since their strategic plan speaks of leveraging the real estate of ALL its libraries. It’s very important to note that the air conditioning at the Brooklyn Heights Library only went unrepaired a few months before they were planning to unveil a rushed plan to sell it. This tactic apparently isn’t confined to just libraries: As we tear down the South Street Seaport there are those who would like to see the South Street Seaport Museum sent packing . . . so it was that city EDC the museum’s landlord was refusing to fix the museum’s air conditioning! But when the city wants to spend money to privatize and shrink space at the (already small) Red Hook Library, Voila, air conditioning gets provided! See: Spaceworks And Its Privatizing Space Grab Of The Libraries. The thought now isn’t exactly to shrink the Grand Army Plaza Library, but they do want to spend money on shuffling around space there, getting rid of books and materials, to shrink other libraries- So go figure it out. But most people know they themselves wouldn’t sell there homes because their air conditioner wasn’t working and that’s a good analogy to think sensibly about these things.